Basement of Ghoulish Decadence: Some goodies from Japanese buddies on Twitter! 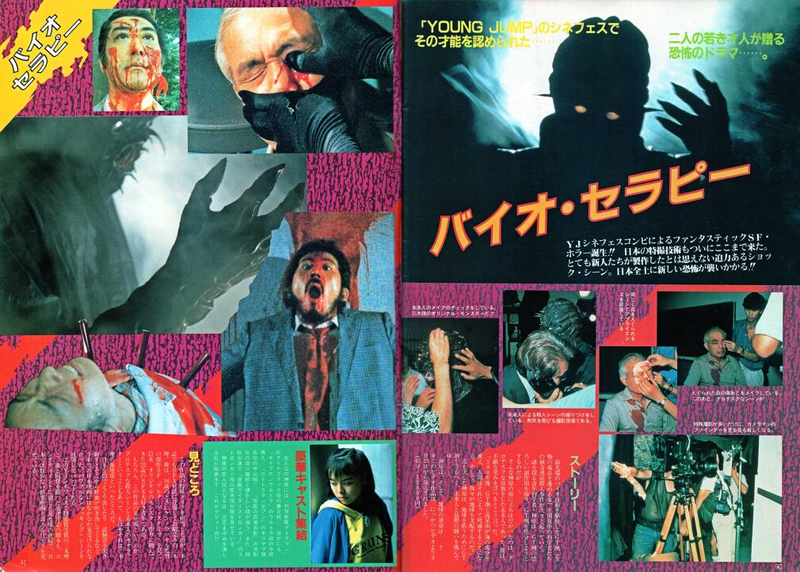 Upon posting the write-up of Cyclops (1987) on BoGD's Twitter this past Tuesday I received a few more cool scans from 2ST1 Splatter, Slasher, Thriller Club contributors (@LucioFulci74 and @yu131). Many thanks! I love seeing this stuff and hope you guys do as well! To the right is Daiei Video's video sales flyer for the VHS/Beta of Lucio Fulci's New York Ripper (Japanese title: ザ・リッパー / The Ripper) (1982) depicting the art collage that graces the video release. This cover is interesting because we never see this level of butchery in Kitty's mutilation in the film even in the uncut version. This shot appears to depict a scene of continued torture after her right eye is brutally razored in two. The sequence ends there and your guess is as good as mine as to why this shot exists (just a promo still or perhaps more was shot and removed...?). This flyer is rarer than the first pressing video it advertises which pops up with regularity on eBay. Daiei later re-released this on VHS at a "budget" price with slight changes to the cover and smaller case size. Surprisingly, the second release is actually much more scarce than the first. Below are two more spreads from the pages of the Japanese horror magazine VZONE of Biotherapy (バイオセラピー) (1986) and GUZOO: Servants of a Forsaken God (GUZOO 神に見捨てられしもの) (1986). Like Cyclops, both are bite-sized gore features made for the Japanese video market. I have Nikkatsu's Biotherapy VHS (and the bootleg DVD that floated around years ago), but the slipbox VHS of GUZOO from ROCO is extremely rare and I've had no luck tracking it down...yet.